Google Analytics has many features people hardly know about or use. One of them is Channel Grouping. What is Channel Grouping and how can you use it? People usually think in terms of silos. For Analytics this means source / medium. People think of “Google / CPC” and “Bing / CPC” as channels. The ROI of these channels should be positive. The source and medium reports however, do not really show the full picture. Especially if you do some brand advertising and you have a somewhat known brand, the ROI you see in GA is usually easy to get positive. However, within this channel, you have Brand campaigns, display campaigns, remarketing campaigns, generic campaigns etc. This whole combination of campaigns might be ROI positive, but parts of the channel not. Google Analytics can already combine similar source / medium channels into one, like “Paid Search” to get an overview of the channel instead of a source. A key driver for digital growth is the ideal allocation of the online marketing spend and the associated analysis of digital marketing channels. 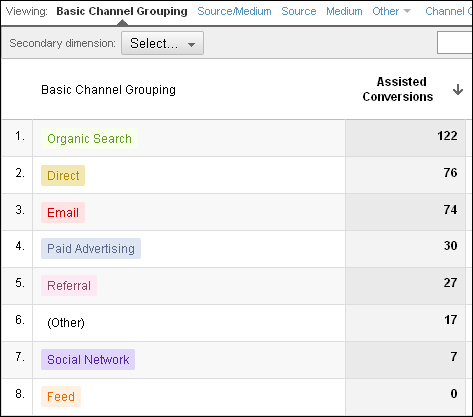 Google Analytics allows you to group similar marketing channels to gain a top level overview. However, in most cases marketing channels have different goals or KPIs which requires a more detailed split. For analysis it is recommended to further split the channels in the Google Analytics default grouping. Google Analytics allows you to create a custom Channel Grouping, based on your own naming convention which will enable you to structure your marketing campaigns at best. This means you can for example see the performance of remarketing campaigns, wether they are in AdWords, Bing, Facebook or a different channel. Using some rules in the Google Analytics backend you create this custom set and you will instantly get a better overview of the channels so you can see if your KPI’s for specific channels are met. You can find more information on channel grouping in Google Analytics on Google’s support website.